My friend recently had his first child and his whole world changed. One of the first things on his to-do list before his newborn arrived was to figure out a better way to store his guns. I suggested a biometric (fingerprint) gun safe. Unlike traditional gun safes that require a key or numeric combination, biometric safes can recognize the fingerprints of the owner. This was a great option for him because now his wife can use her fingerprints to open the safe even when he’s not home. No more keys or impossible combinations to remember – just the peace of mind that their new child is safe and out of harms way. What are the Best Biometric Gun Safes? BARSKA is most well known for their precision sport optic products like binoculars and riflescopes. However, they are starting to make a name for themselves in the biometric gun safe world as well. After all, they’ve built their reputation on building scopes that need to be extremely accurate, so why not apply that knowledge to improving your security at home? Among all of the fingerprint gun safes available on the market, we chose the BARKSA biometric safe for several reasons. The first of which was security. This safe can store up to 30 sets of fingerprints at a time – allowing me to program each member of my family into the safe with room to spare. Having storage for up to 30 sets of fingerprints is important for quick access and finger position variations. 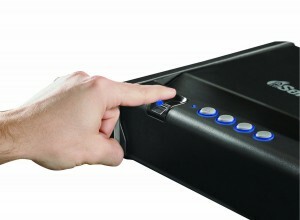 When using a biometric safe it is necessary to program your fingerprint in multiple positions on the reader. 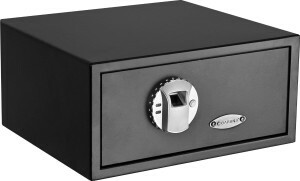 Although these safes are very accurate and reliable, they can also be finicky at the most inconvenient times. This model also comes with back-up keys in case of an emergency. You also don’t need to worry about the power going out because it runs on 4 AA batteries. Although you may want to change them every year for added security, the manufacturer suggests the batteries will last up to two years. The second most important reason why we chose BARSKA over other brands like Stack-On was the size of the safe. This handgun safe is compact and can be easily hid in a closet or under the bed. However, unlike other safes we tested, this model had plenty of room inside to store everything I needed. It can hold a handgun, ammo as well as a few other valuables. Another benefit is that it is large enough to hold documents on the bottom. The inside dimensions are 16.25 inches wide by 7 inches tall by 14.25 inches deep. For reference, the outer dimensions are 16.5 by 7.75 by 14.5. While this wasn’t a deal breaker for me, I should point out that this safe is not fireproof. It is built with solid steel and has a solid two point locking mechanism. Not only are these gun safes more secure since they’re personalized, but they also offer more flexibility in the event of an emergency. Let’s walkthrough a quick scenario. Imagine someone breaks into your home and you need to access your firearms quickly. Would you be able to find the key in the dark? Or would you be able to remember the code under stress or during a chaotic home invasion? Imagine instead that you purchased a biometric gun safe. If someone breaks in, all you need to do is walk to your safe and calmly put your hand on it. Once the safe recognizes your fingerprint the door will immediately pop open. In an instant you’ll be armed and ready. This isn’t just a product that uses it’s advanced technology as a gimmick. It was designed to help you move quickly during life or death situations.